Decarburizing is classed as a thermochemical process. The aim of the process is to bring the surface carbon content of a component to the desired level. Further heat treatment is subsequently applied (e.g. hardening) to produce the desired mechanical characteristics. Carburizing is classed as a thermochemical process. During the process, the surface layer of a component or tool is carburized using a medium that emits carbon. The carburizing process may be followed by intermediate mechanical processing, for instance carburized areas may be machined off. This intermediate processing is generally followed by hardening. Suitable materials are case hardening steels, i.e. steels with a relatively low carbon content. The carbon content of case hardening steels is generally below that of hardened and tempered steels, i.e. less than 0.25%. Recarburizing is classed as a thermochemical process. The aim of the process is to bring the surface carbon content of a component to the desired level. Further heat treatment is applied (e.g. hardening) to produce the desired mechanical characteristics. Case hardening is classed as a thermochemical process. In this process, the surface layer of a component or tool is carburized by means of a medium that emits carbon and subsequently quenched. The effect of this is to improve the mechanical properties (e.g. wear characteristics) of the component’s surface layer. Quenching may be performed either directly at the carburizing temperature or following intermediate cooling and reheating to a material -specific hardness temperature. These are only two variants of all the possible temperature-time sequences that can be employed in case hardening. Case hardening is generally performed at temperatures of between 880 and 980°C. After the carburized components have undergone hardening, tempering is generally required, to relieve any stresses created during hardening, and to achieve the required handling strength. Quenching media are either hot oil or hot salt baths. Partial case hardening is also possible, using suitable isolating methods. Case hardening steels are construction steels with a relatively low carbon content, whose surface layer is generally carburized or carbonitrided prior to hardening. The carbon content of case hardening steels is generally below that of hardened and tempered steels, i.e. less than 0.25%. The purpose of case hardening is to give the surface layer of steel workpieces and tools a significantly greater hardness and to improve their mechanical properties. Case hardened components and tools are characterized by their increased resistance to wear, tough core, and increased bending fatigue strength. Such characteristics are of particular importance in gear components. High uniformity carburizing within a batch and batch-to-batch operation. High precision control of carbon transfer and case depth. Improved mechanical properties, elimination of inter-granular oxidation layer, improved fatigue properties. Good uniform carburizing for narrow gaps and deep blind holes. Carburizing temperatures up to 1.050° possible. Environmentally friendly, no CO2- emission. Complies with high health&safety standards. Carbonitriding is classed as a thermochemical process. In this process, the surface layer of a component is enriched with carbon and nitrogen, and the mechanical properties of the component’s surface layer are improved (e.g. resistance to wear). It basically occupies an intermediate position between case hardening and nitriding. The temperatures used in carbonitriding are lower than for case hardening but higher than nitriding temperatures. The temperatures at which hardening is performed by carbonitriding in gas are generally between 760 and 900°C. While in case hardening it is carbon – and in nitriding nitrogen – that penetrates the surface of the steel, the effect of carbonitriding is based on the diffusion of carbon and at the same time nitrogen. Enrichment with nitrogen serves to lower the hardening temperature and the critical cooling speed, which means that milder quenching can be employed. Both of these factors reduce the risk of distortion. The desired surface hardness is controlled by employing a subsequent tempering treatment. If partial carbonitriding is required, the areas that must not be subjected to carbonitriding can be insulated. Materials suitable for carbonitriding are non-alloy and low-alloy case hardening steels as well as free machining and construction steels. These are generally steels with a carbon content of less than 0.2%. The purpose of carbonitriding is to give the surface layer of steel workpieces and tools a significantly greater hardness and to improve their mechanical properties. This process is particularly suitable for increasing the resistance to wear of the surface layer of low-alloy and non-alloy construction steels. Carbonitriding results in increased resistance to wear coupled with low distortion. Tempering follows immediately after hardening. Only when hardening is combined with tempering is a microstructure created that has the optimized mechanical properties for the respective application. Like hardening, tempering is a thermal process that impacts on the entire component, from the surface zone to the core areas. Once in a hardened state, the component displays a very high level of hardness, depending on the composition of the steel, but at the same time it is very brittle and cannot be employed in a hardened state. This gives rise to the general rule of thumb that the higher the hardness, the lower the toughness. The purpose of tempering is to reduce the hardness of a hardened component so that it attains the required toughness values. The accompanying loss in hardness that arises is then simply accepted. It is up to the construction engineer to decide what compromise to set between hardness and toughness, because only he knows the component’s purpose of use and the stress it is to be subjected to. There are some steels, such as hot working and high-speed steels, which demand multiple tempering treatments (up to four times) before they attain their optimum mechanical properties. The duration of the tempering treatment depends on component cross-section and batch size; the minimum retention time following complete through-heating of the workpieces is one hour. All materials that can be hardened can also be tempered. The tempering temperature depends on the steel composition and the desired final hardness. Manufacturers of the various steels issue so-called tempering graphs that display hardness progression in relation to tempering temperature. Tempering treatment improves the toughness of the hardened component and should therefore be performed after every hardening treatment. Either a direct indication of the temperature (which is however relatively uncommon) or the target hardness is required to enable the correct selection of the tempering temperature. It should be noted that tempering temperatures are not always the same even within the same steel quality. Component dimensions and the current batch composition can vary. Precipitation hardening is a form of heat treatment that can be employed to increase the hardness of metals or the strength of alloys. Metastable phases are precipitated in a very finely distributed form; they prevent mechanical dislocation and as a result increase the hardness of the metal. The process of precipitation hardening is based on the fact that the solubility of an alloy component falls as the temperature drops. For this reason, precipitation hardening cannot be performed with all alloys. Precipitation hardening is performed in three steps. Step one consists of solution annealing, which involves heating until all the necessary elements are in solution. The material is subsequently quenched, which prevents diffusion. The solid solution that is subsequently produced now remains in a metastable and supersaturated state. The aging process that follows is actually tempering, i.e. heating. It is at this point that controlled diffusion takes place, and the solid solution undergoes transformation into an alloy of two phases. Very many small, homogeneously distributed precipitations are formed. By choosing suitable materials and selecting the exact procedure, it is quite possible to control and influence the material properties. The smaller the precipitations, the larger the strength attained by means of precipitation hardening. Hardening is a heat treatment that consists of austenitizing and cooling, performed under conditions that allow an increase in hardness to be brought about by a more or less complete transformation of the austenite generally into martensite. Austenitization is the stage of the process in which the workpiece is brought to austenitizing temperature and the steel matrix becomes austenitic through complete phase transformation and carbide dissolution. Austenitizing is followed by cooling. To allow the entire workpiece to take on a martensitic microstructure, the speed of the temperature drop must be greater than the critical cooling speed of the respective steel. Cooling can take place in a variety of media; these differ characteristically in terms of their cooling effect in the various temperature ranges. After hardening, the microstructure of so-called hypereutectoid steels is usually composed of martensite plus residual austenite plus carbide. Great importance is attached to the proportions of these phases, for instance in the heat treatment of tool steels, because characteristics such as resistance to wear and dimensional accuracy are affected by the structural state after hardening. Following hardening, tempering is necessary to relax the martensitic microstructure and to set the required strength. At low tempering temperatures (generally up to 250°C), the martensitic microstructure can be impacted on without any great compromise to hardness. Only at higher temperatures (dependent on the material, but as a rule at T>250°C), is structural relaxation accompanied by an appreciable loss in hardness. The component’s hardness properties can be adjusted by way of the tempering temperature. At considerably higher tempering temperatures (from around 400°C), the process is referred to as steel hardening and tempering. It is then possible to adjust both hardness and mechanical properties of the steel. In principle, any steel can be hardened to varying degrees. However, hardenability depends chiefly on the steel’s chemical composition. Hardenability is the ability of a steel to assume an increased hardness to a greater or lesser depth in the zone close to the surface. The term hardenability refers to both the extent and the distribution of the increase in the workpiece’s hardness.As a general rule, carbon is responsible for hardness. If there is no carbon in the steel (min. 0.22%C), it will hardly be possible to achieve an increase in hardness. Besides carbon, the quantity, type and number of alloy elements in the steel have an effect on hardness, toughness, through-hardenability, resistance to wear, and other mechanical values. Hardening is used to give components and tools sufficient hardness and strength to withstand mechanical stress, such as static or dynamic deformation through tension, pressure, bending or wear. In principle, any steel can be hardened to varying degrees. However, hardenability depends chiefly on the steel’s chemical composition. Hardenability is the ability of a steel to assume an increased hardness to a greater or lesser depth in the zone close to the surface. The term hardenability refers to both the extent and the distribution of the increase in the workpiece’s hardness. As a general rule, carbon is responsible for hardness. If there is no carbon in the steel (min. 0.22%C), it will hardly be possible to achieve an increase in hardness. Besides carbon, the quantity, type and number of alloy elements in the steel have an effect on hardness, toughness, through-hardenability, resistance to wear, and other mechanical values. Hardening and subsequent tempering is classed as a combined thermal heat treatment process. Hardening is a heat treatment process that consists of austenitization followed by rapid cooling. This results in an increase in hardness caused by the more or less complete transformation of the austenite into martensite and sometimes bainite. Tempering consists of single or multiple heating of a hardened workpiece for the purpose of attaining specified mechanical properties. High stability, high fatigue strength, good tensile and impact strength and good alternating bending strength. 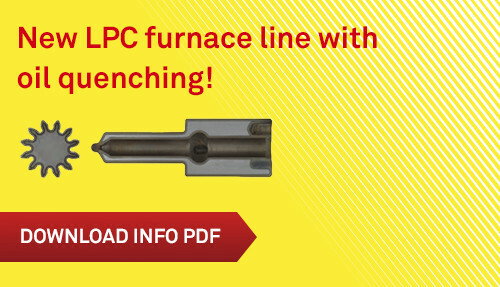 Hardening and tempering creates ideal conditions for subsequent thermochemical heat treatment. The conventional method of increasing hardness or strength is the hardening and tempering process. A second, somewhat more specialised method, is austempering. This heat treatment method involves austenitizing the component in the same way as with hardening, i.e. heat treatments are performed at temperatures of 800-1,050°C, depending on the material. Quenching is performed in a hot salt bath. The bath temperature depends on the material and is somewhere between 250°C and 450°C. The component remains in the salt bath at constant temperature (isothermal) until the structural transformation of austenite to bainite is complete. No martensite is formed in the process. Depending on the material, the transformation may be complete in a few minutes but it can also sometimes take several hours. The component is then cooled in the air and normally not subjected to tempering. Bainite microstructures have very specific characteristics that comprise high strengths (hardnesses), maximum toughnesses, and usually relatively low distortions. Not every component and not every material is suitable for austempering. The positive characteristics described above can only be achieved if no other microstructure is formed during cooling, such as ferrite, perlite or upper bainite. Thin-walled components or alloy steels with high hardnesses are particularly well suited to this process. Typically, components made of steels such as C45, C75, C67E, 42CrMo4, 65Cr3, or 67SiCr5, as well as alloy cast iron can be austempered (ADI Material). The advantage of this method is that it creates the best possible toughness with a high hardness level. At the same time, it offers very favourable conditions for minimizing hardening distortion. Typical example applications for austempering include safety-belt fixtures in automobile construction, springs, nails and special blades, as well as crankshafts made of alloy cast iron. The annealing process comprises the treatment of a workpiece at a certain temperature and with a certain retention time, followed by cooling that is dimensioned so as to attain the desired material properties. Bright annealing involves annealing steel either in a reducing atmosphere or in a vacuum. This prevents surface oxidation (scaling). Diffusion annealing is carried out at a very high temperature and with a long retention time at this temperature, with subsequent discretionary cooling. The aim of the treatment is to attain a uniform microstructure. Solution annealing is primarily used with austenitic steels for dissolving precipitated components in solid solutions and for eliminating stress in preceding strain hardening. Normalizing is primarily performed following prior hot working of components. Heating is performed to a temperature slightly above the hardness temperature, followed by cooling in a still atmosphere, to obtain a consistent grain structure. Stress relieving is an annealing process performed at sufficiently high temperatures (however, with hardened and tempered steels, it is performed below the last tempering temperature), with the aim of reducing internal stress without making any fundamental changes to the microstructure or the mechanical properties. Soft annealing is an annealing process performed at a temperature just below the lower transformation point, followed by slow cooling, so as to obtain a state that is as soft as possible. The longer the nitriding duration, the greater the nitriding hardness depth (NHD). The higher the temperature selected (temperature range 350-630°C), the further the nitrogen can penetrate in a given time. In general however, the internal hardness of the nitrided layer falls as the treatment temperature rises. Materials with nitride-forming elements (e.g. chromium, molybdenum, vanadium, aluminium) display a greater nitriding hardness, but the possible penetration depth of the nitrogen falls as the alloy content increases. The VTN group primarily uses gas nitriding. Here, nitrogen gas diffuses through a split ammonia gas atmosphere, generally at 500-530°C. Depending on the material, nitride hardness depths (NHD) of 0.1-0.9 mm can be achieved by employing long treatment durations of 10-160 hours. The main objectives are improving component strength, wear resistance, sliding properties, temperature stability and bending fatigue strength. Partial treatment can be performed using a paste insulation. All common steel, cast and sinter materials can be treated by nitriding. Non-alloy, low alloy and medium alloy materials are suitable; high alloy materials (> 13% Cr) are mostly unsuitable due to their surface passivity. Hardness is measured in accordance with EN ISO 6507 in HV (Vickers). Nitriding hardness depth (NHD) is measured in accordance with DIN 50190, Part 3. Traditional metallographic testing methods are used to assess the layers. This process is preferentially performed at 570-580°C in a gas mixture of nitrogen and carbon emitting media. The main objective is wear or corrosion protection. Corrosion resistance can be significantly improved when cooling in oxidizing atmospheres. The NHD is 0.1-0.35 mm. Partial treatment is possible. The treatment is performed to produce the desired compound layer; the precipitation layer is usually of secondary importance. This process is preferentially performed at 570-580°C in a gas mixture of nitrogen and carbon emitting media. The main objective is wear protection in combination with high corrosion protection. The NHD is 0.1-0.35 mm. Partial treatment is possible. The treatment is performed to produce the desired compound layer; the precipitation layer is usually of secondary importance. VT-N-Ox® is a gas nitrocarburizing process with oxidization, optimized by VTN. The process achieves an optimum combination of wear protection and corrosion protection. This process is preferentially performed at 570-580°C in a gas mixture of nitrogen and carbon emitting media. The NHD is 0.1-0.35 mm. Partial treatment is possible. The treatment is performed to produce the desired compound layer; the precipitation layer is usually of secondary importance. Brazing is a thermal process for substance-to-substance material bonding. A liquid phase is created by a solder or by diffusion on the adjoining surfaces (diffusion soldering). The liquidus temperature of the base materials is not reached. In contrast, this temperature is exceeded by welding. A substance-to-substance bond is formed when the solder hardens. VTN offers brazing in a vacuum or protective gas or with induction in a conveyor furnace. This process involves melting the layers applied to the tool (e.g. with flame sprayed coatings). This gives rise to melt splices between the applied layer and the base material. This can be performed using a process in a protective gas atmosphere, under vacuum or using induction heating. As a heat treatment process, sintering is associated with brazing. Granular or pulverous substances are bonded with a base material by heating. A general term to describe the heating of materials over a long period. With cast iron (malleable cast iron), the process refers to the tempering of ledeburitic cast iron to obtain the disintegration of cementite. The targeted transformation of residual austenite by combining conventional heat treatment techniques with deep freezing is frequently the most practical procedure for attaining the desired material properties. Residual austenite is the portion of the austenite that remains in the microstructure after quenching to room temperature. In certain cases, in particular when using high alloy tool steels, a steel’s austenite content can have a decisive effect on its usability and grade. VTN can perform deep freezing down to -100°C. This group comprises all thermal and thermochemical processes for treating NF metals, such as solution annealing and the aging of aluminium alloys.